We had so very much fun celebrating the feasts of St. Therese last week! I knew I wouldn't be able to get to everything I planned, but we sure had fun trying! 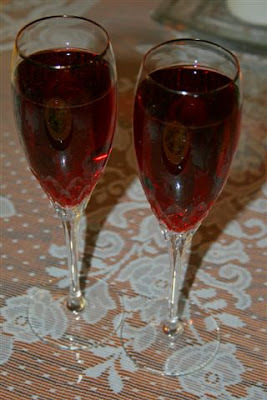 Delicious Rose Wine in our wedding champagne glasses! My happy children... My "Shower of Roses!" I'm so impressed! What a lot of fun you must have had last week. How beautiful! Your children are sure to remember her feast day as something very special. My daughter wants to spend St. Therese's feast day at your house next year. Such a perfectly pink party...Sunshine is soooooo there! What a joyful family memory and meaningful tradition. So many great ideas and certainly so many smiles from heaven! Exquisite, Jessica!! 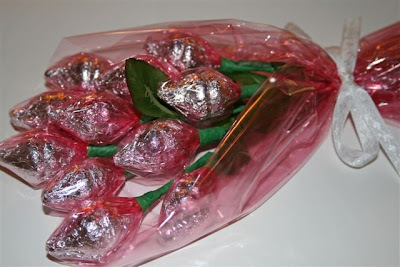 What a lovely, "rosy" celebration for your wee ones...thank you for sharing with us! Ohhhh! I love it love it love it!! Thanks so much for sharing! Thank you also for the kind note you left on my blog. Please tell us more about your relic. I have a thid-class relic on a St. T. chaplet. Looks like so much fun! They all look so adorably happy in the last picture... but how can one not look happy when there is a cake in front of them? Nancy ~ It is a 1st Class Relic (a tiny piece of one of her bones) that was given to us by my brother-in-law! 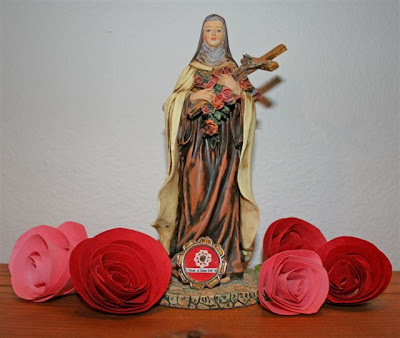 We are so blessed to have it in our possession, especially since she is a favorite saint in our home, and has been very instrumental in our lives. Looks like you enjoyed your celebration. My kids would love to live at your house! OH, it is so beautiful to see it all put together! You did a wonderful job of everything! My littlest has the same purple jammies as your daughter! *I love those rose cupcakes! Beautiful!